Jeremy Corbyn has promised to listen to Labour members' calls to keep the UK in the EU single market - but warned it could hamper the government's ability to protect jobs and invest in industry. The Labour leader said EU restrictions on state aid and pressure to privatise sectors like rail could cause problems. He also predicted "a lot" of people would continue to come from the EU to work in the UK after Brexit. Mr Corbyn was speaking on day one of the Labour conference in Brighton. 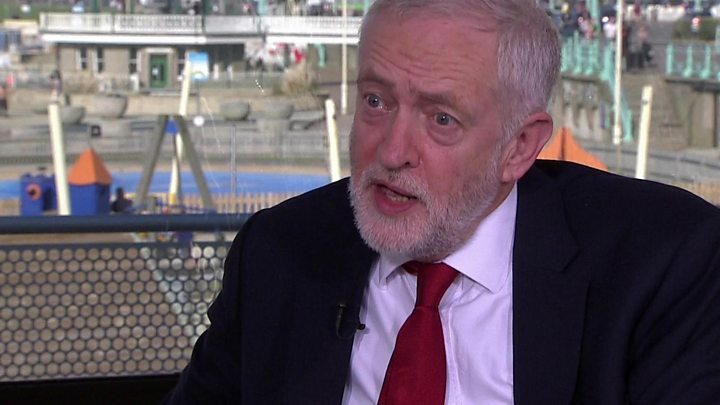 Boosted by Labour's better-than-forecast general election result in June, he told the BBC's Andrew Marr Show he wanted 10 years in office to implement Labour's agenda, saying at least two electoral terms would be needed to address challenges on housebuilding and inequality. More than 40 senior party figures signed an open letter to the Observer urging Mr Corbyn to commit to remaining in the European single market and customs union after Brexit. But delegates in Brighton have rejected demands from a number of constituencies for a vote on single market membership during the conference. BBC political correspondent Iain Watson said that, in practice, it means there will be no vote on one of the most contentious issues in the party. Labour has already said it would keep the UK in both agreements during a transitional period. Theresa May has suggested a two-year timeframe for a transition period, but Mr Corbyn said Labour's version would last "as long as necessary". It is "impossible" to say at this stage how long it would be, he argued. Asked about his plans beyond this period, Mr Corbyn said the "important priority" was seeking tariff-free trade access to the EU's markets, and that it was necessary to "look very carefully" at the terms of any trade deal to avoid restrictions on state aid, citing the UK's steel industry as an example. "We need to be quite careful about the powers that we need as national governments," he said. Mr Corbyn wants to return a number of key industries, including the railways, to public ownership, but says EU competition laws present significant obstacles to that. One of the signatories to the letter, former minister Ben Bradshaw, told BBC News remaining in the market was "the only place we can sensibly be if we want to save the economy, end austerity and pursue the sort of vision of Britain that Jeremy Corbyn says he wants". The customs union is the EU's tariff-free trading area, which imposes the same taxes on imports from certain countries outside the union. The single market also includes the free movement of goods, services, capital and people. Speaking at the Labour conference, Stephen Kinsella, a lawyer specialising in EU law, said he was "puzzled and slightly troubled" by Mr Corbyn's comments about state aid. "I think what we see in the UK is too often government refers to EU law as an excuse, as a reason for not investing. But it could do so, and it could do so within the law," said Mr Kinsella, who is a Labour Party member. The letter urging long-term commitment to the single market and customs union, co-ordinated by the Open Britain campaign, was signed by both Blairite and left-wing MPs, along with some prominent trade union leaders. It said: "The supposed benefits of a clean break with the EU are a fantasy. "The economic impact of leaving the single market would hit the most vulnerable in our society hardest." Mr Corbyn is also facing calls to maintain the free movement of EU workers after Brexit from some Labour members, despite this being ruled out in Labour's general election manifesto. "Manifestos evolve and change," MP Clive Lewis, one of those pushing for the matter to be debated at conference, told the Sunday Politics. But fellow Labour MP Caroline Flint said she did not think maintaining the current arrangements "would be acceptable to British people". Asked about free movement, Mr Corbyn said he understood "the importance of workers moving from one place to the other", but some employers had "grotesquely exploited" the system to pay EU workers very low wages. "That has to stop. But we have to recognise that in the future we're going to need people to work in Europe, and people from Europe are going to need to work here. There's going to be a lot of movement." In his Marr interview, Mr Corbyn also promised an end to the public sector pay cap. He would not commit to the 5% increase called for by some, but promised workers a rise in line with inflation - currently 2.9% - in addition to recognition of the "sacrifice" they had made in recent years. The Labour leader side-stepped questions about whether he would support illegal strike action by public sector workers against the cap, as backed by his ally, Unite leader Len McCluskey. A new law requires a 50% turnout for successful strike ballots, but Unite is calling for co-ordinated action across sectors regardless of the threshold reached. Repeatedly pressed on whether he would back unions defying the law, Mr Corbyn said: "I will be with those workers demanding a decent pay rise." But speaking on Sky News, Labour's deputy leader Tom Watson said the party would not back unions in such circumstances. "I have actually received a letter from Len McCluskey this week where he says he accepts Labour MPs aren't going to support calls for illegal strike action," he said. Mr McCluskey confirmed that was the case, saying he did not expect support from the party's leadership or any of its MPs. "I know that they are opposed to the current law and they will do all that they can inside Parliament to change this law," he told ITV's Peston on Sunday.